Los herreros estructurales eligen estructuras y arcos de estructuras hechas de acero y de hierro. Juntando las vigas de apoyo, las vigas de acero, columnas, y otros materiales estructurales con remaches, pernos, soldaduras y otro tipo de sujetadores, estos artesanos trabajan juntos como un equipo muy unido para construir puentes, edificios comerciales e instalaciones industriales. Tweets about "#steelworker OR "structural ironworker""
Adaptive Construction Solutions Inc., located in Houston, Texas, recruits, trains and integrates veterans into the ironworking industry. 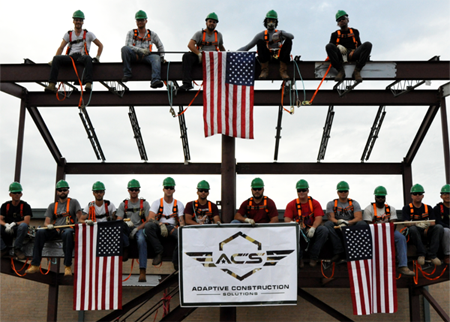 Adaptive Construction Solutions, which opened its doors in April, completed its first three training classes, providing more than 70 veterans with introductory ironworking training and careers with notable Houston steel erection companies like Empire Steel, Steelco and Postel International. 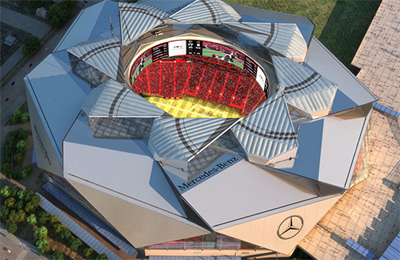 "The best or nothing” is the global tagline for Mercedes cars, and it also applies to the new stadium being built for the Atlanta Falcons. Mercedes Benz Stadium in Atlanta is innovative and one of a new era of sports designs around the world. According to recent reporting in The Atlanta Journal-Constitution, the 71,000 seat stadium for the Falcons and the 32,000 configuration for the Atlanta soccer team is now scheduled to open in June of 2017 after delays for additional structural design for the “oculus” roof and the panoramic video screens.